We’ve got five copies of ‘Greater Springfield – Australia’s Newest City’, by Madonna King and David Fagan, to give away! Each copy is signed by the founders of Greater Springfield. QLD 4300. ABN 35 055 714 531. Telephone: (07) 3819 9999. Terms and Conditions will prevail. to use their information in this way, they cannot enter the competition. nephew, brother, sister, step brother, step sister or first cousin. will include the parent or legal guardian’s full name and signature. will be awarded to the winner’s parent or legal guardian. and no substitute will be offered. AEST and concludes on Wednesday August 22, 2018 at 11.59pm AEST. the Promoter, not the time of submission by the entrant. 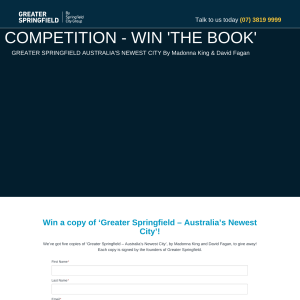 entry form found at https://www.greaterspringfield.com.au/greaterspringfield-the-book/. QLD 4300 on Thursday August 24 at 10.05am AEST. conducted on the following business day. decisions the Promoter makes about the Promotion. draw. Prizes will be awarded to the person named in the entry. entry mechanism used to submit their entry. Madonna King and David Fagan. implications may arise because of accepting the prize. 23. Prizes cannot be transferred, exchanged or redeemed for cash. to or delay in transit of prizes. authorities if they are a prize winner or otherwise as required by law.